Soldiers would be coming soon. Icanthus had yet to see them, however often he turned to look over his shoulder; but they were coming. He knew it in his bones. It was dawn, and butter-yellow light was shining, jewel-like, on the thick sheen of frost that covered the world. The light was warm, but not quite warm enough to cut through the bitter cold that had kept Icanthus walking and shivering all night long. He cursed the sunrise. Sunlight meant daytime, and daytime meant people, and people meant capture. He had to hide. He’d reached the foot of the mountains the night before, and made his way up a narrow goat-herder’s path along the mountainside. In the high altitude, the wind groaned around the solid, frozen rock, shuddering through the sparse growths of misplaced foliage. Between the solid rock on the one side of him and the steep drop-off on the other, Icanthus could see nowhere to hide. Even if he did stop and try to get some sleep, in the freezing wind he suspected that it would be a much longer, more final sleep than he wanted. He could go back. Perhaps it would be all right. In any case, it would be better than freezing to death. He gave the unworthy thought a feral growl, and tugged at his cloak, feeling the sharp spike of pain as the fabric moved across his ragged back. A small trickle of blood dripped, pleasantly warm for the two seconds before the cold got to it, from a freshly opened cut. Icanthus gritted his teeth. He would not go back. He would not turn around. On the other side of this hellish peak, the lands of the Robber King, where there were no slaves and no masters, lay as a promise of freedom. He would not turn his back now. Even if he froze to death here, he would still be free. Slave-tattoos or no, he had no master now, and he never would again. The fiery words did not make the wind bite less. His empty stomach twisted, and a sudden spasm of dizziness hit him. Icanthus reached out a hand to steady himself on the cliff face, leaning heavily. The rock that was supposed to meet his fingers did not, and he fell. For a split second, his overtired brain wondered if he was falling down the mountain; but then he hit the ground and wasn’t dead. He was in a cave. A cave where the rock was dry and, though far from warm, protected from the biting wind. Moss grew sporadically, and was the softest thing Icanthus had felt in days. He didn’t bother to get up. He was weary to the very bone and no longer cared if he froze to death. Too tired even to shiver, Icanthus curled up under his cloak and fell into an exhausted sleep. A muzzy-headed world of dreams held fur cloaks, hot spiced wine, and blazing fires. Icanthus woke to darkness and a dry throat. He blinked, worked his tongue fruitlessly, and looked at the pattern of shadows on the cave walls. Moonlight, he thought, reluctant to get up. Time to strike out once more towards freedom. He did not want to strike out towards freedom. He wanted to go back to sleep. It was comfortable, sleep. Warm. Pleasant. His slowly waking mind caught on a thought, tugging at it like a stream at an intruding branch. Sleep. Dreams. Comfortable. Warm. With a dull click of facts fitting together, Icanthus suddenly realized that there was something soft and solid resting against his back, and that whatever it was, it was breathing. It growled softly in its sleep, and every muscle in Icanthus’s body went taut. A huge lion. A great mass in the dark, large as five men–a giant. Away from the beast’s warmth, Icanthus’s own heat was draining quickly. Shaking with equal parts cold and fear, he began to back out of the cave. It was just his luck to stumble across what was probably the only ginormous mountain-dwelling lion in the world. Just his luck. Please don’t wake up, please don’t–he sang inside his head, hope and prayer both. 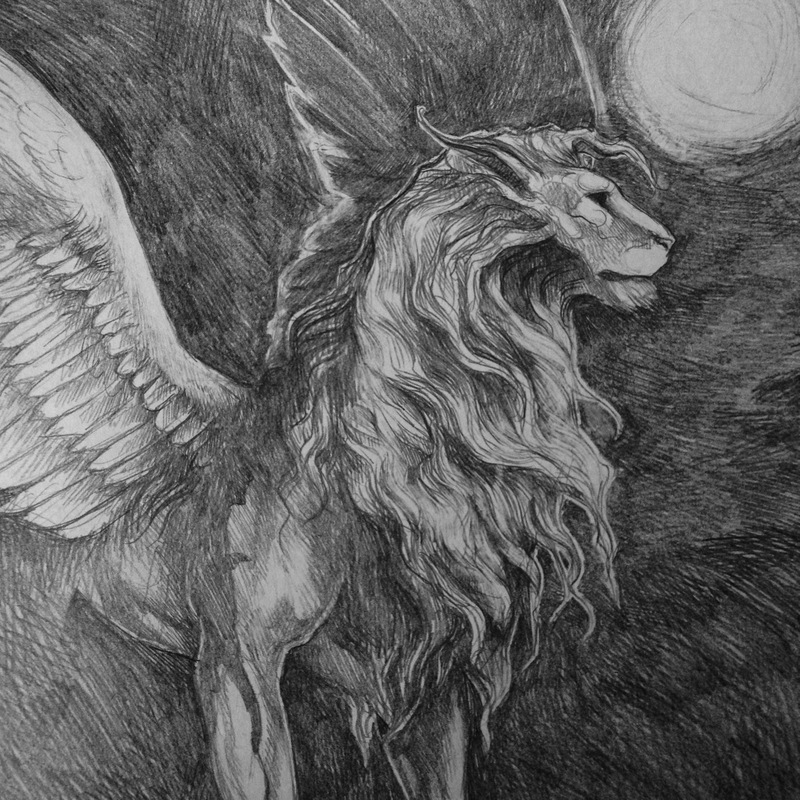 The great form shifted, a head rising up and turning until the moonlight glinted off of two great yellow eyes. It was a wonder that Icanthus’s heart didn’t stop. It raced in his chest, panic-weak, and his mind refused to do anything at all but order his feet to keep walking back, back, slow and calm and steady, as the beast stood up and began to follow, step by step, until they were both bathed in moonlight and Icanthus knew, with an odd certainty, that to step back any further would send him hurtling off the mountain. He stopped. The beast was tall as a young tree, and towered over him in a startling outline of silver. A lion’s eyes stared down at him, and a lion’s mane trembled softly in the bitter wind. The beast yawned, stretching out great wings that showed up bright against the bitumen night. The gryphon shut its yawn with a lazy clack of teeth and tilted its head to look down at Icanthus, regarding him with the same air a housecat might regard a small bug that could be a suitable snack, plaything, or both. Trembling, Icanthus didn’t dare move. And then, with a low keening sound, the great beast laid down at his feet. Its head swung around, nosing with pitiful gentleness at a place fear the base of its wing, then back to Icanthus, expectant. The moonlight made the scene a silent one, despite the moaning of the wind. If the gryphon had eaten him, Icanthus would have been annoyed. But only mildly so, and only for a very short while. It was expected of monsters who showed up at midnight to eat people, however inconvenient. But the creature was looking at him as though he was supposed to do something; and, tired and cold as he was, doing something sounded much more unpleasant than being eaten by a gryphon. Frankly, Icanthus wanted to go back to sleep and not have to wake up for another day or two. “What is it?” he finally asked aloud, snappish from cold and annoyance. His limbs still shook with fear, but his mind was too tired to bother. The gryphon jerked its head around to the base of its wing, snorting impatiently. It wanted him to look at its wing. He did not want to look at its wing. However, with the great forepaws on either side of him and only the sheer cliff face behind, he didn’t have much choice. The wind nipped at Icanthus’s very bones, making his fingers feel like dry twigs and his feet turn into lumps of useless stone. The gryphon huffed again in soft impatience, and the gust of warm air washed over him like an all-too fleeting taste of heaven–if, that was, heaven smelled faintly of freshly slaughtered meat. “Don’t eat me,” Icanthus ordered, taking a step forward. He had to climb over its great forelimb to get close to its wing, and it shifted–ever so slightly–as he did. Iron-hard muscle rippled under him, and needles of visceral caution prickled inside his chest. The attractive option of running away as fast as he could tripped briefly across his mind. Then he saw the creature’s side. “Oh. Oh, gods,” he whispered. He’d thought that the smell of meat had been on the beast’s breath. It had only made sense. he couldn’t see it well, in the dark, but the smell turned his stomach. Great patches painted black, sticky and gelatinous to the touch, trailing tatters of skin and fur. The gryphon trembled when his hand came too near it, and Icanthus didn’t blame him. The wounds on his own back were a pinprick, a parchment slice, compared to this. “What did this?” He asked. The gryphon only stared back at him, dull gold eyes alive with expressionless personality. “Who did this,” he amended, looking at the sick mess. He almost wiped his face with his hand, then realized there was blood on it, and let it down again. The beast shifted with a soft noise of pain, and Icanthus wanted, suddenly, to do something. “I don’t know anything about doctoring,” he said aloud. Partly to the creature. Partly to himself. The only thing he knew about doctoring was that it involved hot water and bandages, and he had niether. A sharp wind blew along the cliffs, and he shrugged his shoulders into his cloak absentmindedly. Then he thought again, and fingered the soft, thin fabric for a moment. The gryphon blinked at him, slowly, as he took the cloak from around his shoulders and began to tear it into strips. “You’d better appreciate this,” Icanthus mumbled, through chattering teeth. When he finally tied the last ugly knot on the makeshift bandage, his fingers had gone mercifully numb. To make up for it, sharp pains were jabbing from his knuckles up to his wrists at every movement. He stepped back, wrapping ice-cold arms around his stone-cold chest. The cloak had not been warm, but it had been keeping him from freezing completely. The gryphon turned its head to nuzzle at its freshly covered wounds, curious. “You’re w-welcome,” Icanthus said. He was feeling snappish, and felt as though he had a right to. With a throaty rumble, the beast swung around, pressing its head into Icanthus’s chest. Warm breath huffed softly around his feet. Surprised, Icanthus reached up a cautious hand to stroke the rough fur on the creature’s forehead. With a rumble of pleasure, it pressed his head into Icanthus’s hand, then shook free and licked his arm. “Ow! Stop that,” Icanthus protested, flinching away. The gryphon’s tongue was sharp as a razor. A lot of razors. Abruptly, the gryphon’s happy rumbling stopped. It looked up, staring out into the blackness beyond the moonlit cliffs. Mouth half-open, it huffed at the air. Icanthus realized, with an odd sense of shock, just how huge and wild and dangerous the creature was. It rose slowly to its four paws, and he took a step back, remembering to be afraid. The gryphon turned on him, looking at him with dark, animal eyes. Then it made that keening sound again–soft and almost friendly–and bent down again, extending a paw to him. Icanthus, with only half a sense of what it wanted him to do, took another step back and the beast huffed with impatience. It stood and lumbered up to him, and Icanthus was paralyzed by the thing’s very hugeness. He remained so until it reached down and clamped its teeth over the back of his shirt. It picked him up, kitten-like, and Icanthus suddenly realized just how fond he was of having his feet on the ground. It let him go, and he dropped heavily into the soft fur of its back. 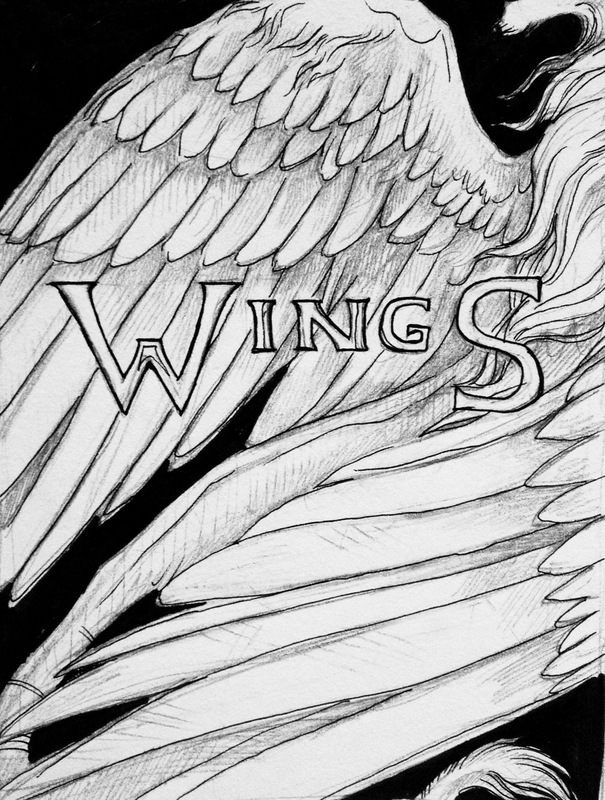 There was a man-sized hollow where the creature’s wings met the space between his shoulder blades, and Icanthus’s half-formed plan to clamber off its back began to lose its luster as the beast’s warmth began to seep into his own frozen bones. Its wings folded like shutters over him, keeping out the wind, and Icanthus blinked. The gryphon started walking, but he couldn’t get himself to care whether it took him across the mountains or back to the tramping soldiers who hunted him. He was warm. And in another moment, he was asleep. Voices woke him. Icanthus burrowed deeper into a bed of fur, not wanting to wake up. The world was too bright and too loud to do anything in it but sleep. His eyes opened, and he stared up at the golden light that drifted through his roof of feathers, listened to the rough voices that surrounded them both. Daylight. And people. He froze, digging his fingers into the gryphon’s fur and praying that whoever surrounded them would leave. Soon. Or that the beast would live up to his fearsome looks and chase them off. Instead, the treacherous creature sat down. Still weak-limbed from sleep, Icanthus’s grip failed him; he tumbled bruisingly down its back and into blinding morning sunlight. Something large loomed between him and the light. Icanthus squinted at it. A rough face, bearded and scarred with eyes as clear as shattered glass, squinted back at him. Icanthus stared up at the face, and edged away until he felt the gryphon’s solid bulk against his back. He was surrounded by amused faces and men with weapons in their belts, and he could feel the slave-tattoos like a firebrand on his skin. These were not soldiers. Somehow, the fact failed to make him hopeful. Tired or not, Icanthus’s hands fisted and he jumped to his feet. His legs trembled under him, and he felt the hopelessness of running like an abyss in his chest. Bitter bile in his mouth, he cursed the gryphon, cursed it. 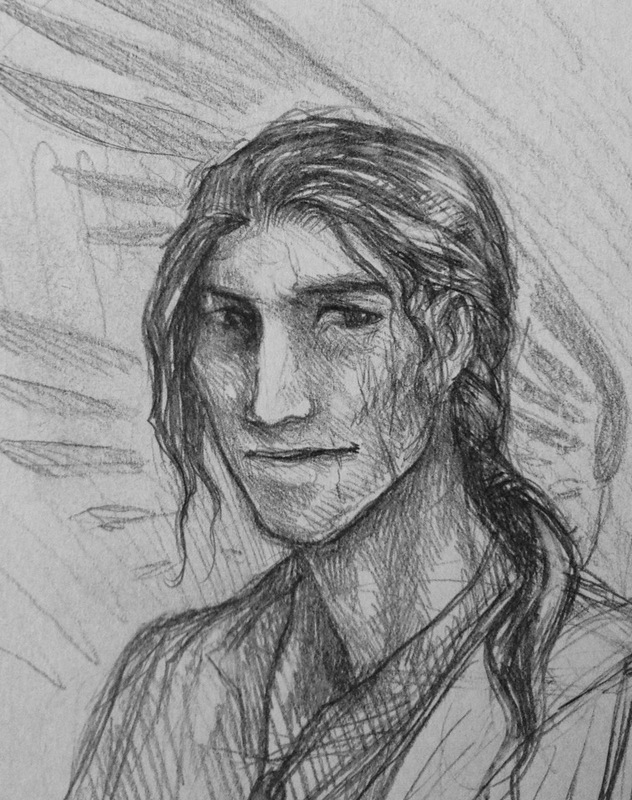 The man called Decimas was looking at him bemusedly, and in the midst of hating him, Icanthus saw that the gryphon wasn’t the only wounded one. Decimas was covered in cuts and bruises, and held himself carefully, as though some unseen wound pained him. 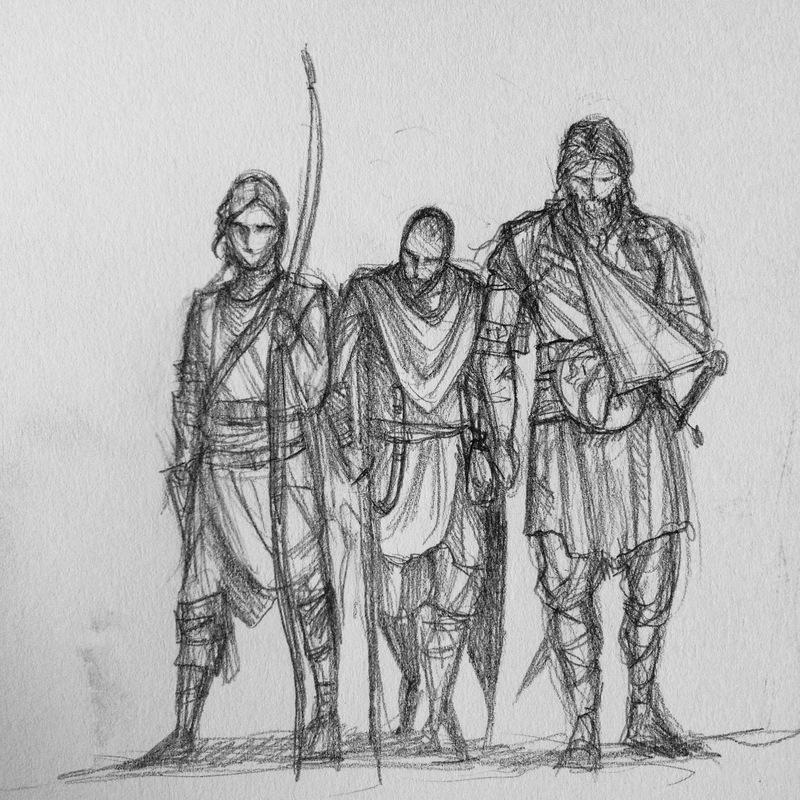 Looking around at the gathered company, Icanthus realized that no one was walking undamaged. The clothes the men wore were worn thin and ragged by long use, and often stained with blood. For all the weapons in their hands and the swagger in their words, these were men who had suffered defeat recently, and not a clean one. Which made them at once ten times more pitiable and a thousand times more dangerous. With a great, comfortable huff, the gryphon shrugged his wings and began to clean one of his paws. “Tom, go get Hemas.” Decimas said, and the bearded man who’d called Icanthus a louse straightened up. The gryphon seemed more than content to sit and lick his paws. Icanthus backed against the beast as much as he dared, seeking a dim idea of protection from the prying eyes around him. Closed in on himself and wondering dully about his fate, he did not hear the faint rustling of movement and voices to one side of the human circle. He didn’t notice anything until the gryphon suddenly got to its feet–a sudden, careless movement that sent Icanthus half-sprawling. The beast was keening joyfully. Icanthus turned, blinked, and saw a man. Tall and dark, with hollows under his eyes and a caution in placing weight on his left leg, he was grinning up at the great beast like a prisoner might grin at a glimpse of sky. The gryphon bent its head to him, pressing into the man’s chest, keening and purring by turns. The man, obviously tired and in pain, nonetheless reached up a hand, knotting it in the creature’s fur. “And he’s brought us a gift,” Decimas called out, aiming a pointed nod at Icanthus, who was now alone in the midst of the horde of men. The tall, shadowy man glanced up, his gaze crossing Icanthus with a faintness of feeling belonging to the very sick and the very tired. “A man?” he asked, with evident confusion. This brought a flicker of a smile to the tall man’s face, followed by a frown as he stepped back, checking the gryphon over. Behind him, there was a thick inhalation of breath, almost a hiss, that drew Decimas’s attention and Icanthus’s along with it. They both found Hemas, looking at what Icanthus knew to be the gryphon’s wounded side with an expression of consternation. He looked up, finding Icanthus’s eyes and holding them with an odd kind of magnetism. “You did this?” he asked. Icanthus, thinking at first that he meant the bloody mess, shook his head vehemently. Hemas went back to studying them, crooning softly over the beast, petting it as though he could heal the creature by touch alone. Icanthus realized, with an odd sense of space, that the surrounding hooligans had trickled off, one by one, to settle around campfires, talking in low tones. It was a largish camp, and Icanthus didn’t stand a chance of running, even with no one watching him. Decimas was looming over him, anyway, standing with the mountains at his back like a posse of armed guards, keeping Icanthus from the Robber King’s lands. “We’re going to have to sell this lump, I’m afraid. I know you don’t like it, Hemas, but with the losses we’ve taken…” Decimas began, but Icanthus stopped listening, looking instead at the mountains, at the glitter of sunlight along their peaks, and feeling an odd tearing in his soul between the wild dreamer who longed to be free, and a dull, practical, half-human thing that, though hardly himself, was likely to survive for a very long time as a slave. He was too tired to feel anything very definite about the division, except that he didn’t like it and he couldn’t do a thing about it. “Need their feed–mutiny otherwise–” Decimas was droning, and Icanthus realized that the mountains looked wrong. In a sudden, wild flash of inspiration, he realized that they looked wrong because he was on the wrong side of them. He snapped his gaze back to the camp. A robber’s camp, and–he looked sharply at Hemas, whose tired eyes avoided his own–a robber king. Icanthus had done it. He’d crossed the mountains, and he was exactly where he’d set out to be. And the Robber King, champion of the poor and downtrodden, was going to sell him. Hemas seemed to have been taking in Decimas’s words, but his gaze had never left Cornibus’s side. Finally, as Decimas’s twelve-part presentation finished hammering out in excruciating, convincing detail exactly why Icanthus should be sold, Hemas looked up. Without hope, Icanthus had nonetheless gained a great deal of last-minute insight. Hemas was the Robber King. He looked so like the legends painted him, and yet so unlike. Like a statue battered by time, or simply a man drained by weariness. He looked at Icanthus for a moment–judging just how small a bag of coins he was worth, probably–and then to Decimas. The same word lifted Icanthus’s head that slumped Decimas’s shoulders. Decimas was quiet, and Icanthus felt his hopes, which had been slowly sinking into a pit of muck, somehow rise out of it all, dripping and dirty, but whole. It was a great deal more than he had expected. He looked up at the tall, reedlike figure, uncaring as Decimas stumped off in a huff, muttering about idiot ideals and fool’s dinners. Hemas followed the man’s shoulders with his gaze for a moment, then dropped it once again to Icanthus. Dark eyes, but bright. Almost fever-bright, and the way he held himself did not seem entirely healthy, but the set of his mouth was kind enough. Icanthus didn’t dare look away. Icanthus didn’t know what to say. “You’re sure–the money–” he finally began, confusedly. Cornibus made a low rumble of assent, and ruffled his feathers. Icanthus stared at him, able to think only of the twin facts that the Robber King needed money, and that the Robber King was not going to sell him. “Aye, food is scarce.” Hemas said, patting Cornibus’s head softly. Enjoy this story? There’s more where it came from. Why not take one of these tales out for a spin?